Over the past week, I’ve had several rewarding encounters with flower farmers, floral designers and avid flower enthusiasts who are eager for inspiration and encouragement about our vibrant Slow Flowers Movement and what it means for their own relationships with flowers. Each new connection is encouraging and inspiring. While we have a long way to go in achieving my goal of putting local flowers on the top of customer’s wish lists and supporting florists who want local and seasonal choices in the floral marketplace, it’s notable to see how much has changed since the first week of the Slow Flowers Podcast, back in 2014. As I said, it took place on November 8th; the threat of frost was upon us and at times as the date approached, I panicked about the availability of fresh, seasonal and local floral options. 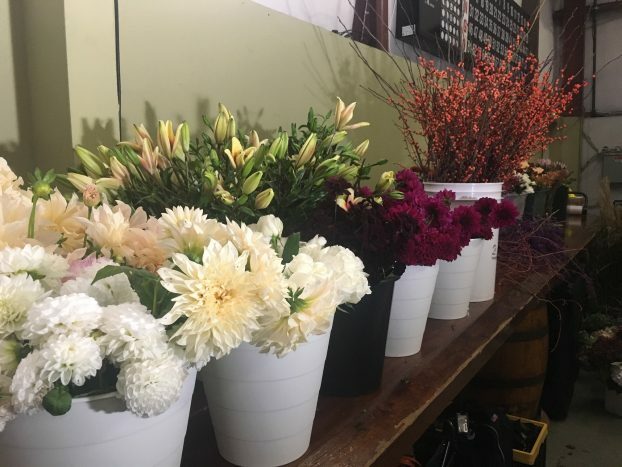 Those talented flower farmers really came through with dozens of dahlias, mums, chocolate cosmos, orange Ilex, roses and sprays, as well as lilies. A sweet haul, some of which you can see above — thanks to Crowley House Flower Farm, Charles Little & Co., Sonshine Farm, Peterkort Roses, Everyday Flowers, Cairn Farm and others. And from Bellingham, I headed to Spokane, in Eastern Washington, on Sunday, where I joined two smart and talented women to be part of a panel at the annual Tilth Conference. Produced by the Tilth Alliance, a coalition of people committed to sustainable farming in Washington and building an ecologically sound, economically viable and socially equitable food system, the conference this year recognized floral agriculture as an important facet of our state’s larger farming community by adding a panel presentation called “Marketing Your Local Fresh Cut Flowers: Consumer Research and Industry Trends,” to the program. The panel was led by Katie Lynd of Washington State Department of Agriculture’s regional markets program. 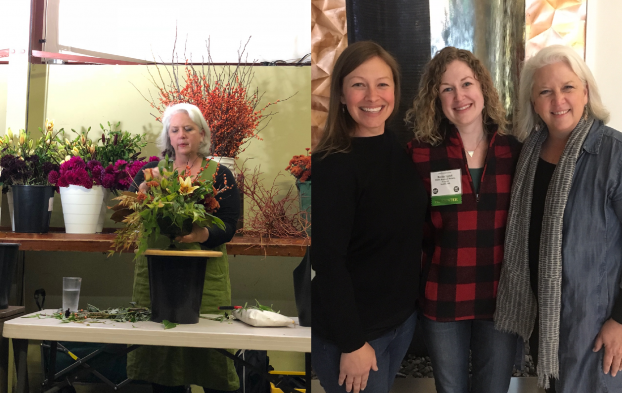 She shared highlights of phase one of “A Collaborative effort to Advance Washington State Cut Flowers,” a USDA specialty crop block grant being administered by WSDA and the Washington Farm Bureau. Slow Flowers is an industry stakeholder in that block grant. Katie presented the results of the grant’s initial quantitative and qualitative consumer research and she asked me to share highlights of the 2019 Slow Flowers Floral Insights and Industry Forecast, the entire report of which you’ll hear on January 2, as part of the New Year’s first Slow Flowers Podcast episode. She also invited today’s guest, Beth Mort, owner of Snapdragon Flower Farm in Spokane. I’m so pleased that Beth was part of the panel because she brought real-life experience and her personal story to the room. 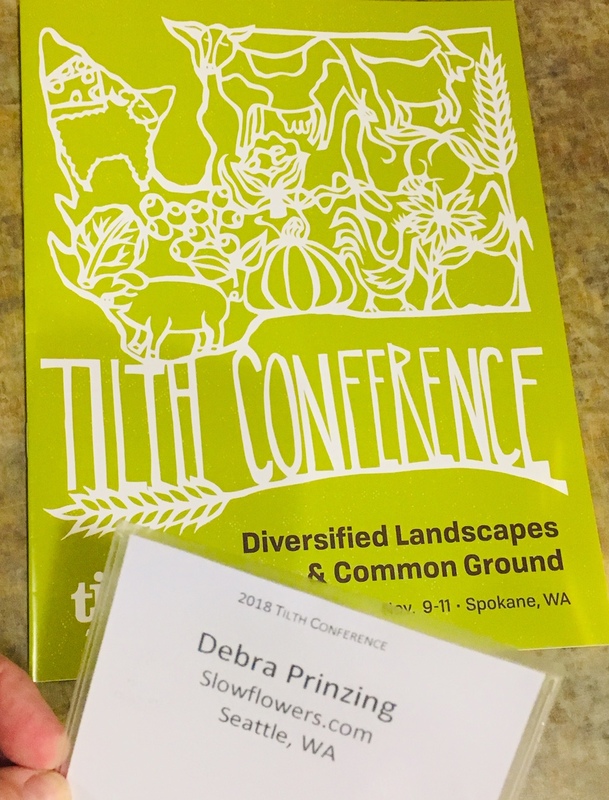 A slide from Beth’s presentation at the Tilth Conference, featuring highlights and flowers from her farm. After our panel presentation was over, Beth and I found a quiet corner of the conference to record a full episode so you can hear her story as well. Beth was raised near Tum Tum, Washington, just outside of Spokane, where she started gardening with her mother at an early age. She says, “I love to learn, and gain knowledge from each person, plant and animal I meet.” As an undergraduate, Beth studied ecology and plant & mushroom taxonomy at The Evergreen State College, and followed this with a Master’s in Urban and Regional Planning from Eastern Washington University. 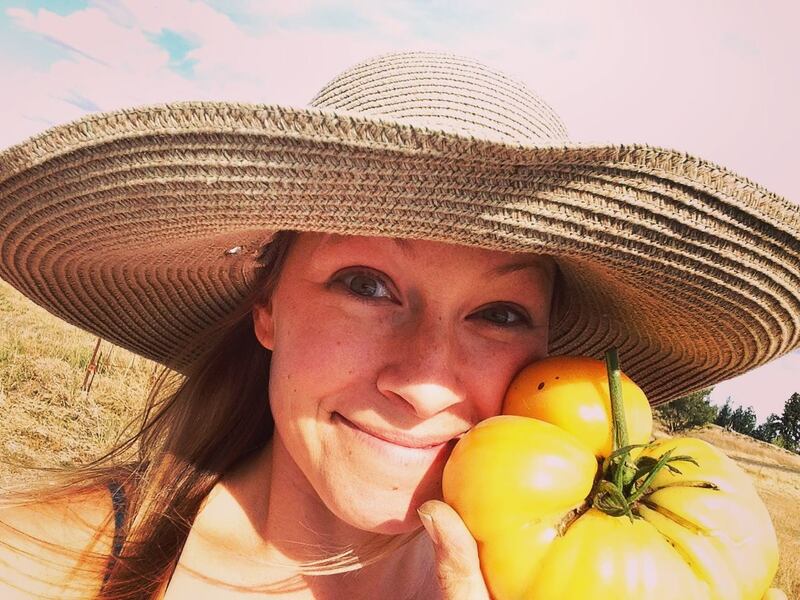 She holds a Permaculture Design Certificate from the Bullock’s Farm on Orcas Island. Snapdragon Flower Farm is located in south Spokane near Tower Mountain. In early 2017, Beth and her husband Mike moved to the land that they rent and leasing from Heron Pond, which they call their “parent” farm. 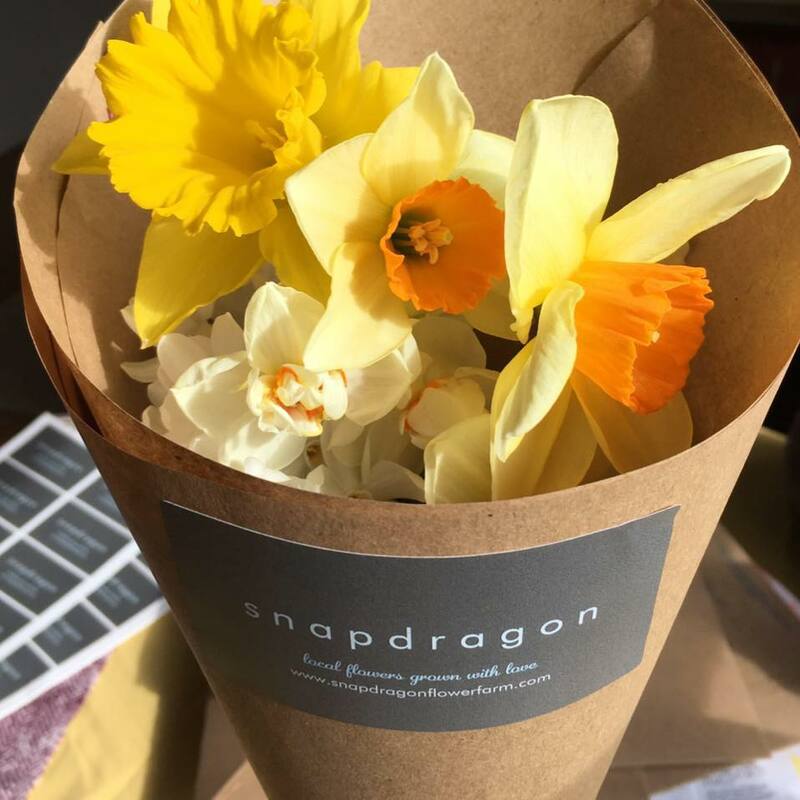 As the 2018 growing season comes to a close, Snapdragon Flower Farm wraps its second full year in flowers. Beth says she is grateful not just to Heron Pond but also for Urban Eden Farm, which graciously allowed her to test out growing flowers in 2016. Beth is also owner of Zinnia Permaculture Design, a Spokane-based garden design company with a focus on food production & building healthy soil while creating beauty and resiliency in the landscape. 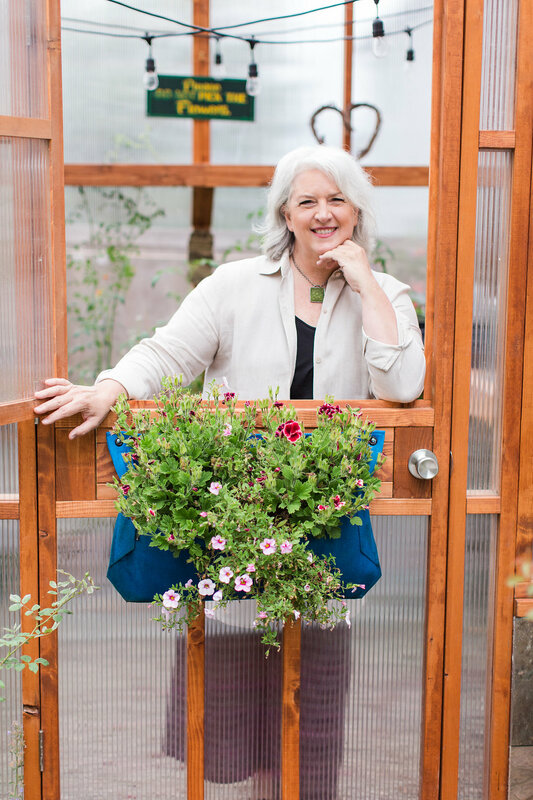 She blends permaculture principles, long-standing food gardening concepts and client vision to produce a dynamic design clients can use to accomplish their goals. Beth, with her poppy crop! As you will hear in our conversation, operating Zinnia Designs allowed Beth to generate some income from her expertise while incubating her dream of establishing a flower farm in Spokane. She applies the same sustainable practices used in food gardening to flower farming. Snapdragon Flower Farm’s clients, colleagues and community — building an important regional hub for local flowers. 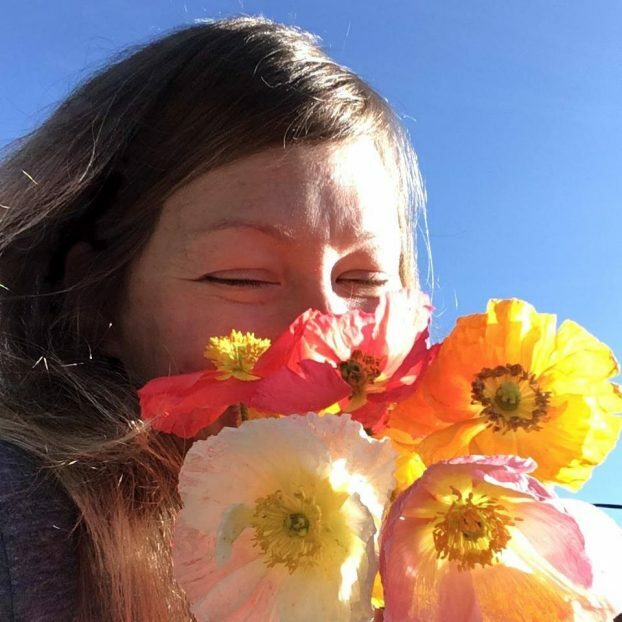 Beth is part of a small group of flower folks in Spokane who recently started a Facebook group for Inland flower farmers and florists. 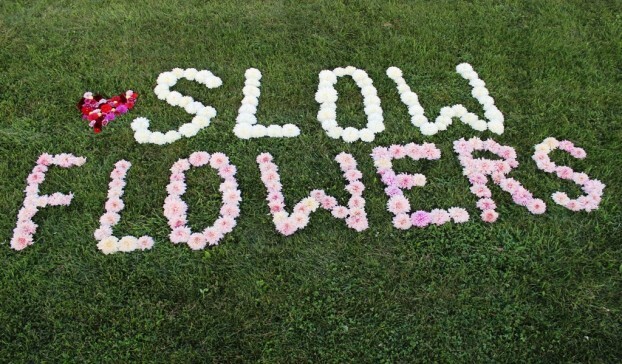 I want to encourage you to visit the Slowflowerssummit.com site to learn more about the amazing program, people and flowers you’ll engage with next summer. It’s not too early to save the date and secure your seat! Slow Flowers members receive special discount pricing and everyone receives $100 off with the Early Bird rate, on sale now! I value your support and invite you to show your thanks and with a donation to support my ongoing advocacy, education and outreach activities. You can find the donate button in the column to the right. The Slow Flowers Podcast has been downloaded more than 380,000 times by listeners like you. Thank you for listening, commenting and sharing – it means so much. 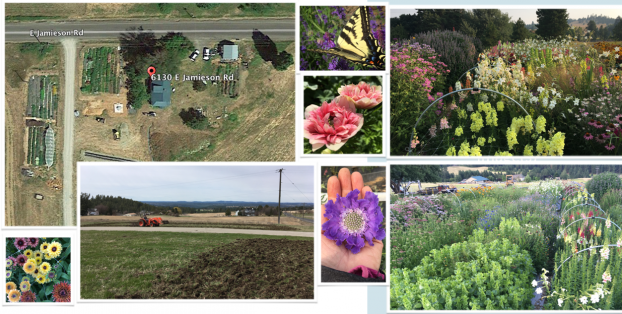 This entry was posted on Wednesday, November 14th, 2018 at 12:50 pm	and is filed under American Grown, Blog Posts, Flower Farming, Podcast Episodes, SLOW FLOWERS Podcast, Slowflowers.com the Directory of American Flowers, Storytelling. You can follow any responses to this entry through the RSS 2.0 feed. You can leave a response, or trackback from your own site.